I haven’t posted in a while because I’m currently trying to wrap up as many backlog PS3 and 360 games as I can before the new systems come out. Not only that but there are several Wii U games I’m still playing, but I’m not in such a hurry with those. I feel all sorts of things when a console generation winds down and a new one is set to start. Mostly just stress, though. Anywho, I figured I’d write about some of the last games I’m playing from this generation of consoles. This particular game seems to be getting mixed reviews. It’s not made by the same guys who made the previous 2 Batman games and in all honesty it’s just more of the same. That’s not such a bad thing, though, especially since Arkham City was a fantastic game. It may not do too many new things, but what is does is still enjoyable. – It’s partially the same city layout as Arkham City so it feels like a lot of retreading. – A lot of the new areas seem to have rather poor grapple points. It’s really difficult to latch on to high places and trying to make your way across the city can be a chore. – The combat seems to have been tweaked a little. You don’t seem to be able to interrupt your animations anymore to counter somebody. I suppose this makes the combat system a little more realistic but it really messes with you when you are used to the old system. – Pretty much the entire voice cast has been replaced. They’re pretty decent soundalikes but I can tell and to be honest it irks me. – A little bit glitchy. Sometimes things don’t seem to trigger right and I’ve fallen through the floor several times along with some enemies which makes it impossibleto kill them. As bad as it may sound… it really isn’t. I’m still having a blast roaming around the city and pretending to be Batman while growling out one-liners. There are several pros to the game that I should also mention. + The story isn’t that bad — It’s actually kind of interesting. I wasn’t really expecting that, especially since I don’t think they brought back Paul Dini to do it. + Some of the new gadgets are pretty cool. I particularly like the remote claw which can shoot out a batclaw to a target and then launch an additional line to something else like a propane tank or fire extinguisher or another guy. It’s fun to play around with. + There’s a neat crime scene mode where you reconstruct what happened to a victim and gather new clues and info. It’s cool to see Batman do some of his detective work, which I’ve always been a fan of. So yeah, I enjoyed it and I think most people who like the originals will as well. It really just depends on if you can enjoy more of the same, especially if it’s more of something that was already really good. + HUGE CHARACTERS! I’ve always loved Hulk and seeing his figure like 3x larger than regular heroes is ridiculously awesome. This holds true for pretty much every large character like Abomination, Thing, Juggernaut, Hulkbuster Armor, etc. Personally I would have loved it if Venom was at least slightly larger than Spider-Man but I’m just thankful for what I got. + So many different characters to play. You’ve got like every freakin’ Marvel hero here: Iron Man, Spider-Man, Thor, Hawkeye, Wolverine, like every other X-Man, Mr Fantastic & Co., etc. I haven’t unlocked everybody yet so I don’t know the full extent of the roster but it’s at least every major hero. Not only that but all of their villain counterparts. When I got to swing around the city as Venom I lost it. Some of them tend to be clones of other heroes but on the large they are mostly unique and have some rather awesome abilities. I’m sure anybody that has seen Lego Thor call down lighting to charge Mjolnir will understand what I’m saying. + Giant open-world New York. Between missions you can roam around the city and do various sidemissions or find collectables. It’s absolutely great. To get there you just SKYDIVE off of the SHIELD helicarrier and free fall until your chute deploys or your webs or boosters or whatever. Flying characters like Iron Man and Thor can zoom around the city at incredible speeds and fly high into the air. Spider-Man can swing on his webs quite stylishly, too. The only thing that disappoints me is Hulk can’t super jump. He can rampage down streets but there’s no large leaps or wall-running. It kind of makes me miss the Ultimate Destruction Hulk game. + The game is pretty hilarious, especially now that the Lego games have voices. There are tons of comic and pop culture references. I think they even got the same guy to voice Phil Coulson, which should be a plus all on it’s own. It’s just all-around a fantastic game and easily the best Lego game ever. Heck, it may be one of the best Marvel games ever. There is honestly only ONE thing wrong with the game and that would be the Dynamic Splitscreen. This thing has been the bane of our existence ever since it hit the Lego games. It is most assuredly the easiest way to make yourself go cross-eyed and get a migraine. The screens spin and separate and just go flat-out nuts. Really the only way to avoid this is to just turn on static vertical splitscreen. It may not be quite as nice as the instances where you can actually share one screen and sometimes it may make seeing certain areas difficult but it is pretty much required if you want to play co-op and not feel sick. So yeah, one flaw that is fairly easily remedied. Other than that it’s just amazing, fantastic, sensational, spectacular, incredible, etc. Insert your favorite. My gaming backlog is like some kind of undying and ever-growing entity. It’s constantly dogging my steps and haunting me. I still have several games I want to finish up before Friday and the arrival of the PS4. Hopefully things go well enough and I can get my thoughts and impressions of the new systems out with a decent amount of haste. So stay tuned in the coming weeks for our take on the PS4 and Xbox One. It should prove fairly interesting. 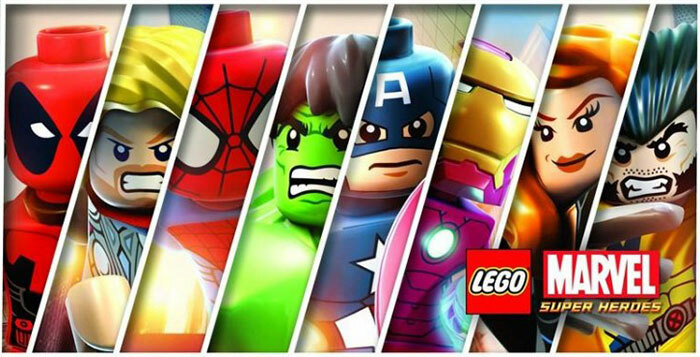 Can’t wait to get my hands on Lego Marvel Super Heroes. I love the Lego games (perfect for casual gaming) and this one looks very promising.